I’ve passed this book before. It’s one of those intellectual best-sellers that sits on tables in the front of bookstores. I’ve picked it up, perused the pages, moved on. Somehow it really never held my attention. But after the enthusiastic recommendations of both a coworker and cousin, I finally picked it up. I’m so glad. Anne Fadiman has a thoughtful tone that illustrates intense experiences without resorting to hyperbole and reviews historical events without devolving into a textbook. The Spirit Catches You and You Fall Down focuses on the journey of the Lees, a Hmong family that is resettled in Merced as refugees. When one of their children is diagnosed with epilepsy, the miscommunication between them and their Western doctors leads to tragedy and heartache. In between chapters about the Hmong’s struggle, Fadiman reviews the turbulent and often tragic history of the Hmong people. Fadiman does not spell out any overt conclusions; her tone remains nonjudgmental and descriptive instead of preaching. Nonetheless, the historical context paints a picture of an independent people. 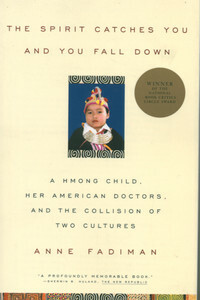 Additionally, Fadiman demonstrates how the qualities that allowed the Hmong to thrive in hostile environments backfire when thrown into the context of the American medical system. On the other side, while the doctors operate with the best of intentions, their inability to communicate with the Lees cause much of their hard-work to be in vain. The indisputable takeaway is that without mutual understanding, our best intentions may go to waste. Anne Fadiman’s descriptive and well-wrought book was one of the highlights of my non-fiction reading. Definitely recommended. Thought-provoking and engaging.